Musician Rubén Blades' new album contains jazz and rumba. Rubén Blades performs with bassist Carlos Henriquez and trumpeter Wynton Marsalis. 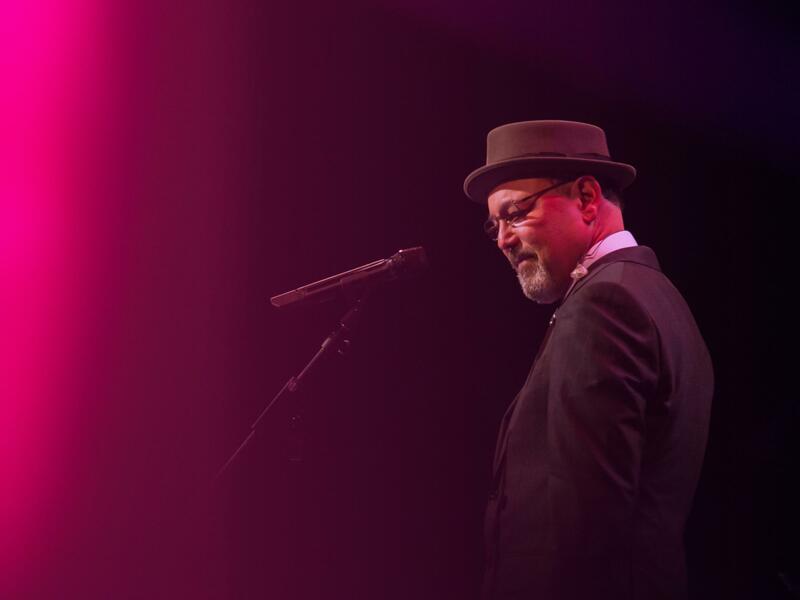 We all knew vocalist Rubén Blades knew his way around the clave, the rhythmic pattern that propels the Afro-Cuban dance music he's known for. But I bet you didn't know he could swing a big band jazz tune with an easy flair that recalls past masters like Mel Tormé, Tony Bennett or Frank Sinatra. 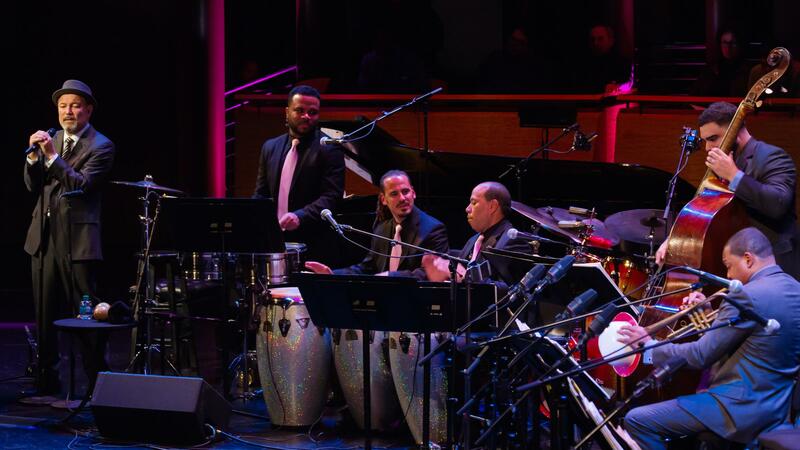 Una Noche Con Rubén Blades by the Jazz At Lincoln Center Orchestra, with Wynton Marsalis and featuring Rubén Blades, introduces a side of Blades that expands his vocal prowess while acknowledging that jazz and Afro-Cuban music have always been very close cousins. While he is from Panama, Blades makes his home in New York where, in the 1940s and '50s, Latin musicians literally rubbed shoulders with African-American and white jazz musicians and created what we know as Latin jazz (it had other nicknames, like Cubop or Afrobop, but the term Latin jazz stuck). That style went on to influence the music that became known as salsa in the 1970s, which is when Blades made a name for himself with the fabled Fania Records label. So singing in front of a jazz big band is really bringing the music full circle. The singer tells NPR that he has been a fan of big band swing ever since he was a kid in Panama, when his dad brought home a record player and some jazz albums. Of course, no man is an island and a jazz singer doesn't exist without a jazz band. On Una Noche Con Rubén Blades, the Jazz and Lincoln Center Orchestra sparkles, as usual, under the direction of trumpeter Wynton Marsalis. In this case, significant credit also goes to the orchestra's bassist, Carlos Henriquez, who helped Blades conceive the album, did the musical arrangements and so expertly lays down the jazz walking-bass musical figure, as well as a deeply infectious Afro-Cuban tumbao. By echoing both jazz masters like Ray Brown and the unheralded Afro-Cuban bassist Bobby Rodriguez, Henriquez is a living example of the compatibility of the two genres. It all comes together flawlessly in the new album, which explores a bit of musical history and features yet another talent from an already-multifaceted musical icon.